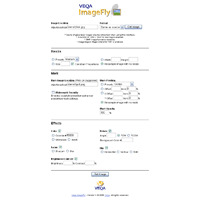 Veqa ImageFly is a PHP tool to get Web images on the fly. Features: resize, watermark, sharpen, blur, brightness, contrast, colorize, grayscale, invert, rotate, flip, and reformat. It supports JPG, GIF, PNG, and BMP image formats and works with GD or ImageMagick MagickWand for PHP. It makes for an ideal solution for sharing various versions of images without a cluttered file mess - saving disk space and your time. Use it for thumbnails for an image gallery, watermarking for copyright protection, or many kinds of image effects for fun display. An infinite amount of possibilities for your Web images can all be created with this in just an instant on-the-fly. O Veqa ImageFly is a PHP tool to get Web images on the fly. Features: resize, watermark, sharpen, blur, brightness, contrast, colorize, grayscale, invert, rotate, flip, and reformat. It supports JPG, GIF, PNG, BMP formats and works with GD/ImageMagick.